Akoma creates one-of-a-kind ethical fashion made from exquisite fabrics that most of the world has yet to discover these are not fabrics that can be found just anywhere. 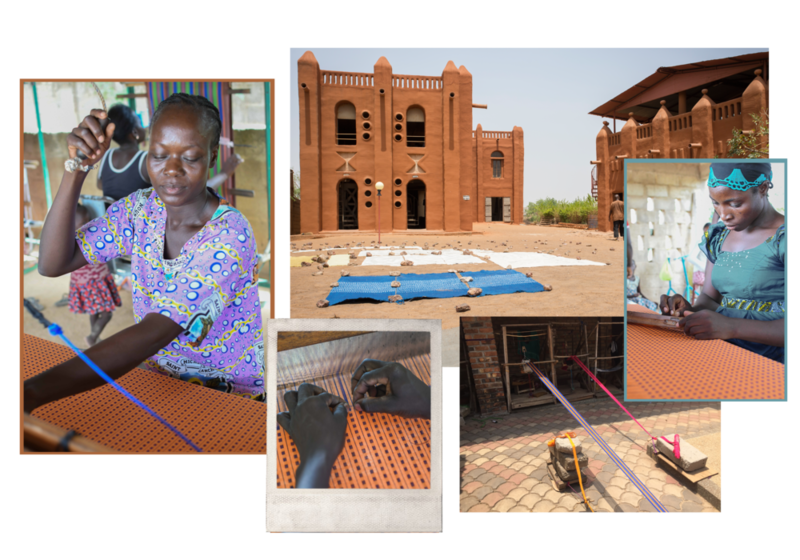 We work with a social enterprise specialized in producing handwoven textiles from Burkina Faso and Mali. In Ghana we work with several independent weavers who are revered for their craftsmanship. West Africa, stretching southwest from Mauritania to Sierra Leone and then eastwards along the Bright of Benin to the Nigerian border with Cameroon, is, in many respects, the heartland of African textile production. These textiles have had and still have an exceptional significance as a means of communication. There is a spiritual and historical significance in the choice of colors, dyes and in the decorative elements; the symbols used and the figural compositions which are directly related to historical proverbs and events. The unique characteristics of our handwoven fabrics include knots and irregularities which should not be considered flaws. Produced in line with ancestral techniques, each item is a cultural expression of the African continent. Richly woven Kente cloth is among the most famous woven cloths of Africa. It originated with the Ashanti people of Ghana in the seventeenth century, who only used geometric non-figurative motifs in their weaving. Conversely, the Ewe tribes from south-east Ghana weave floating motifs on their cloths. Whatever, the region though, Kente cloth was originally woven solely for chiefs and kings; the special cloth became a document of the history of the people. It was and still is to date an important ceremonial cloth. According to legend, two brothers from the village Bonwire went hunting one afternoon and came across a spider spinning a web. They were amazed by the beauty of the web and thought that they could create something like it. Upon returning home, they made the first cloth out of black and white fibers from a Raphia palm tree. Kente has evolved a great deal since it was first produced but it’s beauty remains the same. The brilliantly colorful fabric is entirely handwoven by Ghanaian weavers to this date. Another traditional West African cloth steeped in beauty and tradition is Bogolanfani, the so-called “mud cloth” from Mali. Our fabrics were made by men in the town of Segou, however historically Bogolan was made by Bamana women to the north of the Bamako region. The cloth is made out of Basilan cotton and is dyed with fermented mud. The abstract design is painted on with a darker shade of fermented mud. Bogolanfani is a living art form with techniques and motifs passed down from generations of mothers to daughters; each piece of mud cloth tells a story. No two pieces are alike and each pattern and color combination has a meaning.